Back in this post I had challenged myself to complete my yearly goal of writing 52 posts in 52 weeks and to write a 50K novel. So, today is D day. How did I do? 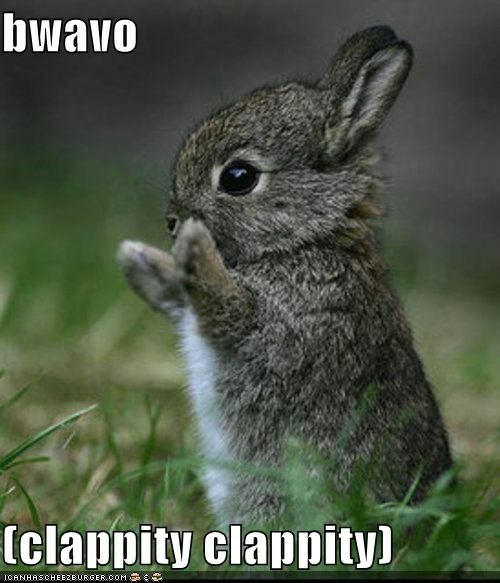 The bunny really is too kind. So, I managed a solid 50/50. Could be better, could be worse. It also shows me that I seem to be able to keep up with the blogging, but its the writing of novels that is still taking a beating. I think the problem comes down to the fact that I always seem to run out of steam with novels whereas I can sustain a few hundred words, or even a few thousand (I made it into the 5K mark officially but that’s really only a tenth of what I was shooting for) but then the writing becomes kinda wooden and the story doesn’t flow and I get frustrated. I do much better with a single idea while it’s hot…but I think with more practice and discipline I can do it. Just maybe more in the bite sized chunks thing. Maybe that will work. I also want to give a special shout out to the people who showed some support on my all new old school challenge who both opted for the “heck ya, you can do it” side of things which is super nice to have. The first blogger is the wonderful Diane from Hometogo232 whose blog is a personal look at family, life, and faith interspersed with some great photos and poems. She has been with me since my very first post and has been so sweet and generous with her support and great comments. Thanks Diane! The second blogger is Misty Lane who’s blog Cinema Schminema is where she reviews the weird, wonderful, lesser known and the horrible in movie land, with a focus on the stuff you probably haven’t heard about and some Z rated horror. She’s cool, funny and has some pretty great reviews. Thanks Misty!